Delicata Squash Stuffed with Farro, Dried Cranberries, and Feta. Uh-mazing. All of these recipes have been tested on crowds and kids, and they’re a hit! As always, don’t forget to save your seeds for roasting. They make a highly nutritious snack and salad topper. Try this recipe for Smoked Paprika Pumpkin Seeds, and sub in your favorite spice! And if you need a squash-slicing refresher, watch Tracy and my quick video on How to Break Down Any Winter Squash. 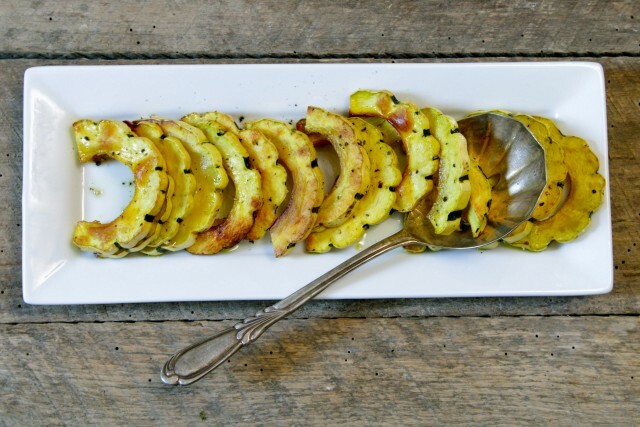 This is one of the easiest ways to prepare delicata squash, or any other squash for that matter. Pop the seeds in the oven to roast too! This recipe is a basic template for getting creative. Try garnishing with apple and parmesan shavings, or pour sage butter over the top. Sprinkle with a simple parsley adornment, or add into salads and soups! Preheat the oven to 425 degrees F and line a baking sheet with foil or parchment paper. Cut the squash into crescent shapes, about 1 inch thick. Transfer the squash to the baking sheet and use your hands to toss with the olive oil, salt and pepper. Squash has notoriously tough skin, making it difficult to cut. That's why I highly suggest investing in a chef knife . It will make slicing this squash a breeze!